This was how Nanay Wowie Tambong of Tulay sa Pag-unlad, Inc. (TSPI) Moncada branch described her experience as a participant of Takbo, Indak, Tanim in Barangay Ablang Sapang, Moncada, Tarlac last August. Takbo, Indak, Tanim is Moncada branch’s wellness campaign and community service activity that involved Zumba dancing, a fun run, and a tree-planting activity. This aimed to heighten the clients’ awareness on the importance of health, while engaging them in a meaningful activity that is not only beneficial to their community, but also fun and enjoyable. “Since Moncada is a catch-basin for flood here in Tarlac, we decided to hold a tree-planting activity in Barangay Ablang Sapang, one of the town’s most flood-prone areas,” Jason Dela Cruz, TSPI Moncada’s branch manager, said. “To make it more enjoyable, some clients and staff suggested a fun run and a Zumba-related activity to uplift TSPI’s wellness advocacies and to add to the fellowship and social value of the event.” Around 300 mahogany trees were planted during the activity. Moncada branch is one of the five branches identified by TSPI’s Community Development Department (CommDev) to implement multiple community development projects that will help address various needs of the clients and of the community. The tree-planting activity is among the projects identified during the clients’ needs analysis conducted by CommDev in March, through which TSPI can further serve its clients and their communities beyond microfinance. “Malaking bagay ang gaya ng TSPI na tumutulong sa aming barangay. 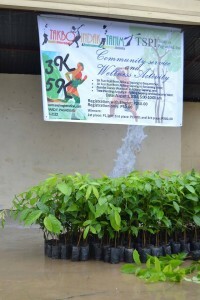 Hindi naman kasi namin kayang ibigay lahat sa mga constituents namin ang kanilang mga pangangailangan,” said Faustino Arellano, barangay chairman of Ablang Sapang, as he highlighted the value of the tree-planting activity and of TSPI’s community development efforts and partnership with their barangay. “Happy ako, kasi first time. Maganda po ito dahil exercise din sa katawan. [At maganda rin] para maka-meet din ng mga bagong kaibigan. Masaya ang pakiramdam kapag nakakahalubilo mo ang iba’t-ibang tao. [I’m very happy because this is my first time to participate in an activity like this. These activities are good opportunities to exercise our bodies and to meet new friends. It feels good when you get to socialize with different people. ],” Nanay Rhodora Padilla, another participant, shared. Both Nanay Wowie and Nanay Rhodora were winners in the women’s category of the 5-kilometer fun run. They were complete strangers before the run but have become friends despite coming from different centers. Each of them received a cash prize for their participation. Their greater prize, however, was more valuable than the money and the medal they received. The activity also served as a family day for some of the clients. Some clients tagged along their relatives to run, dance, and plant with them. Although Takbo, Indak, Tanim was spearheaded by Moncada branch, the entire North Central Sector was also present to show their support, making it a community service activity for the entire sector. “Eleven years na ako sa TSPI. First time kong maka-join ng fun run with Zumba and tree-planting in my entire life [I’ve been with TSPI for 11 years now and this the first time that I have joined a fun run with Zumba and tree-planting],” Ms. Ellaine Cortez, branch manager of TSPI Pozorrubio branch in Pangasinan, said. “[Na-eexcite ako sa mga ganitong activities.] Alam mo na nakakatulong ka. Maganda na makita rin ng mga staff na may participation sila sa community, yung importance ng tree-planting, na pumunta sila rito hindi lang para magsaya, kundi para makipagtulungan sa barangay [Activities like this excite me. You know that you are able to help. It is good for the staff to realize that they also have participation in the community, and to see the importance of tree-planting. We came here not only to have fun, but to work with the barangay],” Ms. Ellaine said. Ms. Ellaine says she considers initiating her branch’s own community service activity. Several branches from other sectors have also initiated community service activities since earlier this year. TSPI staff and clients were not the only ones who supported the project. It was a collaborated effort among various government agencies, organizations, and individuals in Moncada. TAKBO, INDAK, TANIM. Client-participants and TSPI staff join together for a day of wellness and community service. Among them were SJDM Family Worship Center International, Inc., the branch’s ministry partner; Deltacom Sign Base, the municipal health office; Ms. Lita and Ms. Che Mañebo, the Zumba instructors; and the Sangguniang Barangays of Ablang Sapang, Banaoang West, and Baquero Sur. Takbo, Indak, Tanim was a race [takbo] towards a common goal. It was made possible through the synchronized dance [indak] of TSPI and its partners. Through this teamwork driven by the desire to serve the community, inspiration got planted [tanim] in the hearts of all its participants. This article was written by Mr. Gian Erik M. Adao, TSPI’s Community Development Officer. The photos were contributed by Mr. Adao and personnel of TSPI’s Moncada branch. Great effort to help and serve our clients who were affected by the typhoon and floods in the Tarlac area. We should have this replicated also in the TSPI Central and South Sectors. For the Head Office, we can do a “Takbo, Indak at Linis” since we may not have sufficient grounds to plant seedlings. God is pleased with the TSPI organizers and staff together with the clients.